Wilson’s wife, Ciara, and his former trainer, Gunnar Peterson, had an idea. They recommended that the quarterback consult with Dr. Philip Goglia, a “food coach” who had also worked with other top athletes like NBA All-Stars Kevin Love and Carmelo Anthony, in addition to celebrities like Kim Kardashian and Chris Pratt. Upon meeting with Wilson, Dr. Goglia discovered that the quarterback had been consuming about 2,700 calories each day. In order for Wilson to improve his body composition and his overall athleticism, Dr. Goglia had a surprising recommendation. He wanted Wilson to do exactly the opposite of what most people would do if they wanted to lose weight and tighten up. Dr. Goglia recommended that Wilson increase how much he was eating each day. In addition, he didn’t just want Wilson to bump up his daily intake by a few hundred calories. He wanted him to nearly double the number of calories that he was eating. He had Wilson switch to a new diet that included nine meals and 4,800 calories of nutrient-dense food every day. So, what happened for Wilson on his new, 4,800-calorie eating plan? In less than four months, his body fat percentage dropped from 16% to 10%. He lost about 15 pounds of fat- while preserving his muscle mass. Again, this happened by nearly doubling how many calories he was eating. Note: He also got stricter about which foods he was eating. There is a key lesson that might not be obvious from Russell Wilson’s weight loss example. To be clear, the point is not that anyone who wants to lose weight should start eating nine meals and 4,800 calories a day. For the average person, that sort of program would likely lead to significant weight gain. It worked for Wilson due to his high activity level and his significant muscle mass. Each of those factors help him burn many more calories each day than the average person. Here is the primary lesson from this story: High performance occurs along a curve, not along a straight line. I refer to this as The Performance Curve. Your key to success in virtually every area of life- whether you want to improve your body composition or anything else- is to find what I refer to as your High Performance Sweet Spot. This is the point at which more or less of a behavior starts to cause a decline in performance. As for Wilson’s diet, he found that 4,800 calories was his High Performance Sweet Spot for daily caloric intake- based on his goals, body type, activity level, and so on. Less (or more) than that would actually cause problems. Most people make the mistake of thinking “if some can be too much, ‘less’ must be better.” Most people also think “if some is good, ‘more’ must be better.” In reality, there is a point at which “more” becomes counter-productive and dangerous for anything- even behaviors that are typically considered good. For example, cardiovascular exercise provides many benefits mentally, physically, and psychologically. However, there is a point after which more cardiovascular exercise will lead to over-training, injuries, and muscle loss. Many competitive endurance athletes experience these problems from doing too much cardio (and not enough strength training). As another example, doing intellectually stimulating work can provide many benefits personally and professionally. However, there is a point after which more work will lead to burnout, health problems, and poor relationships with friends and family. Many ambitious business leaders experience these problems by working too many hours (and not investing as much time and energy into other important parts of their lives). In addition, there is often (not always) a point at which “less” can become dangerous. For example, eating too few calories (whether you are a pro athlete or an average person) can lead to more body fat, less energy, and problems with your health or performance. The challenge is finding your High Performance Sweet Spot for different parts of your life. That includes how much you should eat, how much you should exercise, how much you should work, how much you should sleep, and so on. Too much or too little in any of these areas will cause problems. You have to figure out what works best for you. You also have to recognize that what works best for you today might be different from what worked best for you in the past and what will work best for you in the future. Remember The Performance Curve. NFL star quarterback Russell Wilson lost 15 pounds of fat in less than four months by eating more. Here is a question to ask yourself: Are there any areas of your life where you might actually get better results by moving in the opposite direction- rather than moving further in the same direction? More is not always better. Less is not always better. 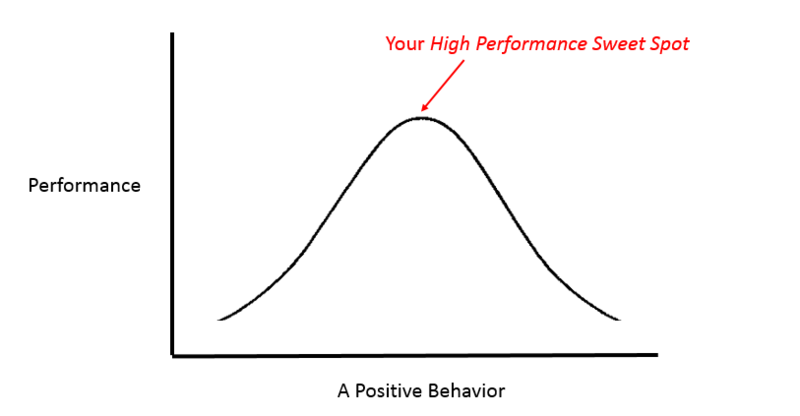 Find your High Performance Sweet Spot somewhere in the middle, and recognize that this point will move up and down over time. 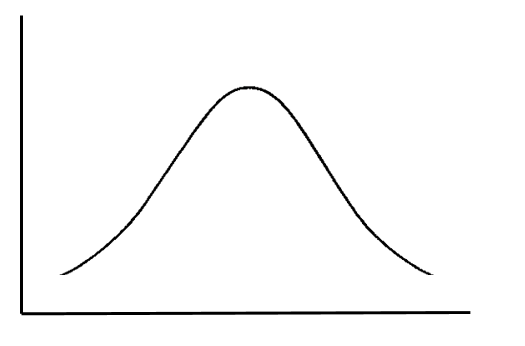 High performance operates along a bell curve, not along a straight line. Digate Muth, Natalie. “What are the guidelines for percentage of body fat loss?,” American Council on Exercise, December 2, 2009, https://www.acefitness.org/education-and-resources/lifestyle/blog/112/what-are-the-guidelines-for-percentage-of-body-fat-loss. Kapadia, Sheil. “Inside Russell Wilson’s nine-meal, 4,800-calorie diet to cut weight,” ESPN, June 29, 2017 http://www.espn.com/blog/seattle-seahawks/post/_/id/25942/inside-russell-wilsons-9-meals-a-day-4800-calorie-diet-to-cut-weight.